In1968 I was introduced to Kurt Vonnegut's mind-busting novels by Eric Mottram, with whom I would later study for an M.A. in American Lit. The first that I devoured was God Bless you Mr Rosewater, an extravagant and devastating exploration of the world of the very rich which so fascinated F. Scott Fitzgerald. In 1972, BBC Two broadcast a TV program which began and ended with parts of an afternoon's conversation between Vonnegut and Adrian Mitchell. It was much more a meeting of minds than the usual author-journalist confrontation. In the middle was Between Time and Timbuktu, a surreal fantasy based on Vonnegut’s novels, produced for America’s National Education Television Playhouse by WGBH and first broadcast on March 13 of that year. Someone had the brilliant idea of bringing Bob and Ray into the act, and so part of it was narrated by them (ad lib, of course), reporting a space rocket blast-off from Mission Control. Alas, the film is now only available as a pirate DVD (reader after reader on the IMDb page urged Vonnegut to allow its commercial release); a tantalizing fragment of it, consisting of the Bob and Ray exchanges, was posted on YouTube, but has been blocked. All this was well before domestic video recorders were commonplace, but I had the foresight to record the sound track on my open reel Ferrograph 88 with an Electrovoice 635A mic. (Old age allows one to remember with precision every detail of the glorious past and forget the miserable yesterday.) I find no record of the BBC program in any online bibliography and so, to repair this omission, I’ve digitized the interview soundtrack and put it up HERE. 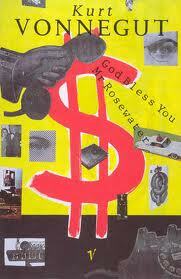 Near the beginning of their exchange, Mitchell reads a stunning excerpt from God Bless You Mr. Rosewater. Like all good economic analysis—the sort that never gets written by Wall Street’s mouthpieces--it is so utterly contemporary that it makes you wonder if Vonnegut had just returned breathless from a journey in H. G. Well’s or Ronald Wright’s time machine. [There is a] Money River, where the wealth of the nation flows. We were born on the banks of it—and so were most of the mediocre people we grew up with, went to private schools with, sailed and played tennis with. We can slurp from that mighty river to our heart’s content. And we can even take slurping lessons, so we can slurp more efficiently. [We learn from] lawyers! From tax consultants! From customers’ men! We’re born close enough to the river to drown ourselves and the next ten generations in wealth, simply using buckets and dippers. But we still hire the experts to teach us the use of aqueducts, dams, reservoirs, siphons, bucket brigades, and the Archimedes’ screw. And our teachers in turn become rich, and their children become buyers of lessons in slurping. Born slurpers are never aware of slurping. And they can’t imagine what the poor people are talking about when they say they hear somebody slurping. They don’t even know what it means when somebody mentions the Money River. It’s still possible for an American to make a fortune on his own—provided somebody tells him when he’s still young enough that there is a Money River, that there’s nothing fair about it, that he had better damn well forget about hard work and the merit system and honesty and all that crap, and get to where the river is. “Go where the rich and the powerful are,” I’d tell him, “and learn their ways. They can be flattered and they can be scared. Please them enormously or scare them enormously, and one moonless night they will put their fingers to their lips, warning you not to make a sound. And they will lead you through the dark to the widest, deepest river of wealth ever known to man. You’ll be shown your place on the riverbank, and handed a bucket all your own. Slurp as much as you want, but try to keep the racket of your slurping down. A poor man might hear. PS: I’m re-reading, for the third time, Ronald Wright’s brilliant dystopian SF novel, A Scientific Romance. Go for it! PPS For real Vonnegut fans, HERE is a complete video of Between Time and Timbuktu. Kurt would be amused by the fact that, in spite of the fact that I entered the name, Vimeo chose to label it Untitled.